INCI Ingredient Label: Water, Coconut Oil, Palm Oil, Olive Oil, Sodium Hydroxide, Fragrance, Shea Butter, Castor Oil, Spa Salts, Fluorphlogopite, Titanium Dioxide, Iron Oxide, Tin Oxide. NOTE: This project and these instructions have been written for someone who has experience making soap and knows the potential dangers due to working with sodium hydroxide. It will not outline all safety methods of working with dangerous chemicals, it is simply a soap recipe for advanced soapmakers. Put on your protective gear. This is very important since you will be working with an extremely caustic base that can and will burn you if you touch it. Noxious fumes are also released from the exothermic reaction that occurs when you mix the sodium hydroxide with water. In separate containers weigh your water and sodium hydroxide. Slowly add the sodium hydroxide to the water and continue mixing until all flakes are dissolved. Set aside and allow to cool. Weigh oils and butter and place in largest microwave-safe glass measuring cup. Microwave until all butter is melted. Measure fragrance oil and stabilizer in separate beakers and set aside. Add 2 tsp. Sparkle Light Gold Mica Powder to a plastic beaker and Sparkle White Champagne Mica Powder and Matte White Pigment Powder to the other. Pour a small amount of your melted oils/butters into each beaker and mix well using the mini mixer. Set aside. In a small glass measuring cup add 1 oz. spa salt and spritz with rubbing alcohol. Add (3) 0.15 ml Micro Size Scoops of Sparkle Light Gold Mica Powder. Mix until salts are covered and set aside for later. Place cupcake liners on jelly roll pan for stability and set aside. When the oils and lye water are about the same temperature (100°F) you will want to mix your fragrance and stabilizer together. Mix well and allow to sit for at least 2 minutes. You then can begin mixing your soap batter. Place stick blender in the oils and tap it on the bottom of the bowl to "burp" it and release any air bubbles. Pour the lye water over the shaft of the stick blender. Carefully blend your oils and lye water until the mixture comes to a very light trace. Add in the fragrance/stabilizer mixture, stirring by hand. Pour approximately 2 cups of the batter into your clean measuring cup and set aside. This will be used for the cupcake icing. To the remaining batter add the Sparkle Light Gold Mica/oil mixture. 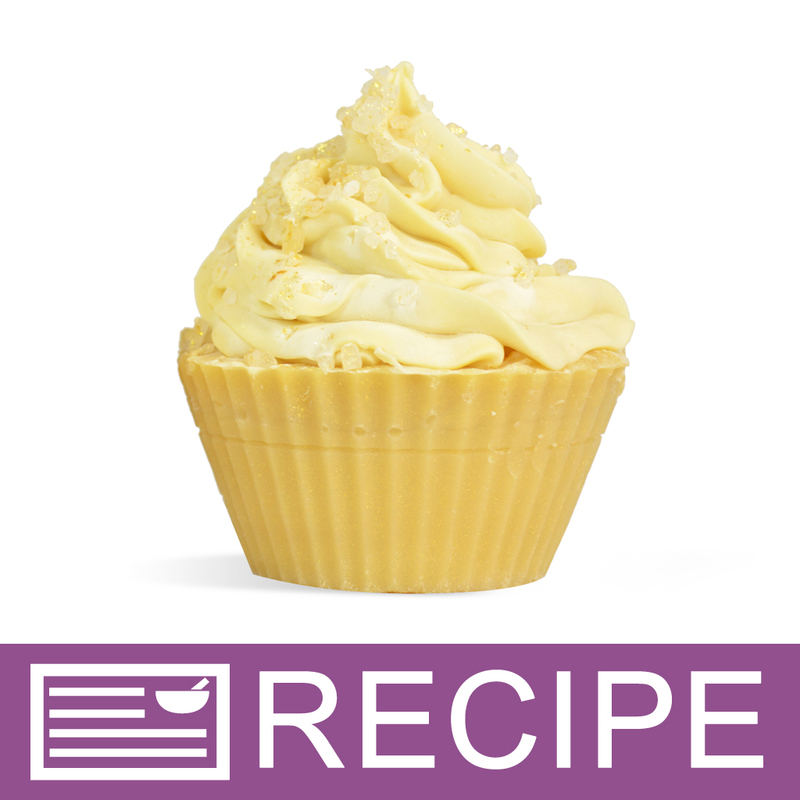 Continue mixing with stick blender until you reach a light/medium trace and then pour evenly between all cupcake liners. To the remaining bowl of soap batter add the Sparkle White Champagne/oil mixture. Continue mixing with stick blender until you reach a heavy trace. This will be piped onto the cupcakes as icing so it needs to hold its shape. When soap batter has reached this consistency begin filling the Decorator Pro. Pipe frosting onto all cupcakes and top with colored salts. After 24-36 hours, carefully unmold the cupcakes. Allow the soap to cure fully for 4-6 weeks. Package as desired and label accordingly. 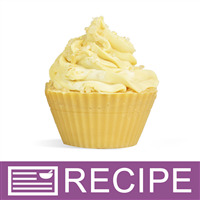 "After I pipe the frosting on, do I need to spray it with 91% alcohol do avoid soda ash? If I don't spray it will it have soda ash on it?" Staff Answer It is not listed in the recipe to do this but you can certainly spray your soap with alcohol to prevent soda ash.